JP Ahonen’s Belzebubs collects the eponymous webcomics. Ahonen is a Finnish cartoonist and former musician who previously drew and co-wrote the graphic novel Sing No Evil, which combined music and the supernatural. 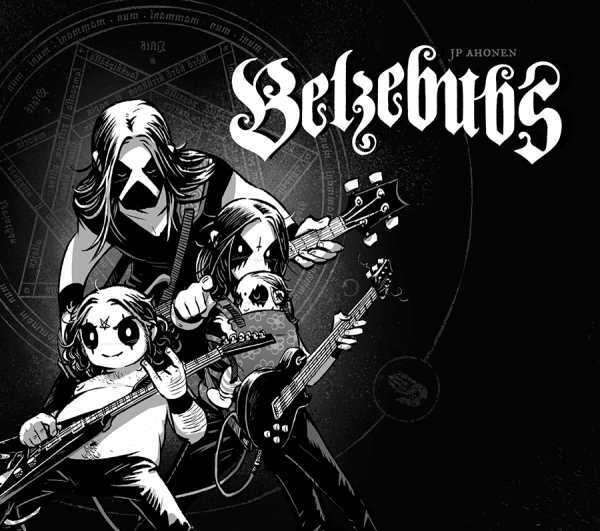 With Belzebubs, he introduces the “mockumentary” of a somewhat typical family, with one major exception: they’re all Satan-worshipping, corpse paint-wearing, black metal fans. Belzebubs is very funny. In one of the first webcomics in the book, Sløth, leader of the Belzebubs band, cries foul at a comparison between his Satan-praising metal and gospel music; in others, what would seem like insults (Sløth tells his wife, Lucyfer, “You look like death”) are actually compliments. Plenty of jokes revolve around the couple’s children, Leviathan and Lilith, flipping the typical suburban script: “rebelling” by saying prayers or notifying the parents about monsters under the bed, not because they’re scary but because playing with monsters is more enticing than sleep. Though these jokes are consistently humorous, Ahonen avoids falling into a repetitive rut by developing his cast of characters, particularly as Lilith shows a romantic interest in a prog-rock-loving classmate. Ahonen’s black and white art is excellent, as good at depicting quiet, subtle family interactions as big, over-the-top monsters and metal concerts. Belzebubs is not for the faint of heart or easily offended; aside from the “reversal” humor of a loving, even boring, family that dabbles in the occult, there are mild sexual references and cursing throughout the book. But metalheads and readers who like irreverent humor will greatly enjoy Belzebubs.